Fourteen-year-old Alan’s background presented a perfect recipe for unhealthy weight gain. He grew up in a poor neighborhood with neglectful parents mired in substance abuse. Food was scarce in his home; homemade meals were unheard of; and Alan’s “dinner” was often chips and soda from the local convenience store. Alan was placed in state care when he was 12 and later diagnosed with bipolar disorder. Isolation, depression, and poor nutrition had already triggered harmful eating habits and weight gains for Alan, but the side effects from lithium added to his 300-lb weight. After several disrupted foster home stays, Alan was placed in a residential program. The program’s clinicians are striving to create a multipronged approach that will effectively treat and manage Alan’s mental illness, recondition his eating habits, manage his physical health, and resolve his early childhood trauma. This scenario could be set in anyresidential group home in the country. Social workers across America are dealing with the fallout from a childhood obesity problem that is nearly epidemic in proportion. Consider these statistics: According to data from the Centers for Disease Control and Prevention’s 2009-2010 National Health and Nutrition Examination Survey, 16.9% of children and adolescents aged 2 to 19 were obese, with a higher number of boys (18.6%) than girls (15%) who were obsess and more adolescents (18.4%) than preschool-aged children (12.1%) who were obese. Obesity is an especially vexing issue for child welfare agencies. A wide range of factors inherent in the socioeconomic, environmental, and even genetic backgrounds of child welfare clients predispose them to the problem. An insufficient knowledge of healthful eating habits, instability among caretakers, and limited access to healthful foods and safe outdoor exercise spaces are issues disproportionately common among child welfare clients. Client’s depression, stress, low self-esteem, and other mental health challenges often trigger overeating. And medications prescribed to improve mental health, such as psychotropic drugs, frequently have metabolic side effects that can further contribute to unhealthful weight gains. Fortunately, child welfare agencies are well positioned to address obesity among clients. As a profession dedicated to helping children at risk, we understand developmental issues, a systems approach to care, and recovery and independence. We’re knowledgeable about the mental health and therapeutic interventions needed to support the population and have expertise working with families impacted by poverty. At The Home for Little Wanderers (The Home), one of New England’s largest nonprofit child and family service agencies, we work with more than 7,000 children and families statewide, including 150 congregate care clients in six group homes and three residential schools. As our clients’ surrogate caregivers, we are conscious of the opportunity and, in fact, obligation to directly impact clients’ overall wellness. With that obligation in mind, we recently launched a wellness initiative, establishing a management plan and creating structures and systems dedicated to improving client wellness, beginning with our congregate care residents. The practice of holistic health recognizes wellness (nutrition and physical fitness) as critical to the emotional, social, and mental health of the families we serve. The Home embarked on its wellness initiative by revising our mission statement to clearly reflect our commitment to physical well-being. The management plan we used to implement our initiative involved multiple challenges and factors. Congregate care residences, with their variations in client ages and capacities, frequently have significant differences in programming structure, foodservice systems, and staff knowledge concerning nutrition and wellness. 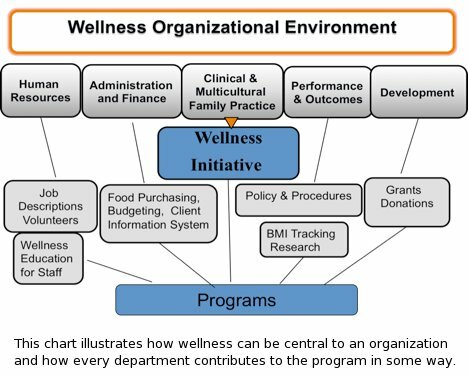 These differences contributed to some of the challenges we faced in implementing a wellness approach. Our chief challenge, however, was in grappling with the fact that our initiative needed to involve not only all our residential clients, their diets, and their physical activity but also all our employees as well as dozens of processes and systems throughout our organization. Given these myriad challenges, we created common practice guidelines specific to areas such as our meal service environment, menu planning, and integrating healthful eating and physical activity into treatment planning. Central to these guidelines is a policy establishing wellness committees. These committees provide very useful forums from which to gather input from different sources, set goals, and track achievement. Ideally, agencies should begin wellness programs with baseline health measures against which they can track individual client’s progress. These measures must consider client’s histories regarding their mental health, physical well-being, nutrition, and diet. Medication management, for example, may require stringent eating habits, as side effects from medications can increase or decrease appetite, intensify agitation, or bring on lethargy. Clients who have caregivers with mental illness may have deeply ingrained, unhealthful dietary habits and may not have been exposed to wholesome physical activity. Diabetes, asthma, and other chronic illnesses can impact weight and/or the ability to participate in physical activity. As part of The Home’s initiative, we revamped our initial client health assessment questionnaire to include several new questions concerning physical activity, such as how often someone is active and what kinds of activities, and nutrition, such as eating habits, as well as standard health history questions. We also modified our client information system to include a field for data from a monthly measurement of client’s body mass index (BMI) instead of just height and weight. A nurse administered the initial assessment and measured client BMI monthly. The results of these assessments have been vitally important in evaluating clients’ needs; making appropriate referrals for healthcare, nutritional, and other treatment interventions; and measuring client progress. Any wellness initiative must include client, staff, and caregiver education as its cornerstone. From a macro level, all program participants need wellness knowledge for their own health. Within the congregate care setting, individuals who visit and work with residents are role models, making it imperative that they understand and demonstrate the healthful behaviors advocated in the program. Direct care workers play an especially critical part in role modeling and setting examples for residents. (At The Home, guidelines were set for direct care workers dining with residents to eat what is being served and not bring in their own individual foods.) From an agencywide perspective, all employees need to appreciate the goals and tenets of the initiative to participate in related decision making and collaboration. One of the first wellness educational ventures The Home tackled involved an online learning course. We created a two-part wellness course that briefly covers an array of topics, such as the Dietary Guidelines for Americans, food safety, healthful cooking methods, and physical activity strategies. At first we required only the staff in our congregate care program to pass both parts of the course. Now all current staff members are required to take and pass both courses, with successful completion being linked to their annual performance evaluation. The course is also a required part of training for all our new hires. In addition to more structured learning, dietitians, nurses, or educated staff members can make important contributions to wellness education. We hired a part-time dietitian to provide information and support to clients and have augmented that support through one-on-one and group wellness discussions led by other knowledgeable staff. Nutrition education can involve games, tactile visual aids for those who learn by doing, and even taste testing with residents and staff. The systems an agency uses for food purchasing, planning, preparation, and budgeting may all need to be updated to meet new wellness goals and guidelines. If an agency doesn’t have standardized processes for food purchase, individual group homes may be purchasing food from different vendors or even from the local grocer. However, by engaging a single food vendor or meal service company, agencies can reduce food costs, streamline ordering and tracking, and ensure adherence to nutritional guidelines. At The Home, we had been purchasing food from 11 different vendors for our nine congregate care programs, and staff members were often supplementing supplies with trips to local grocery stores. As part of our wellness initiative, we began to centrally order food for all residences, a move that simplified food budget projecting and tracking. Of course, centralized food ordering is predicated on the idea that meal planning will be centralized as well. Meals that are planned based on dietary guidelines and are part of a cyclical menu can be planned by a staff dietitian. Client and staff input should be solicited, and ethnic food preferences considered. The Home’s dietitian created a four-week cycle menu and increased the use of whole grains, low-fat dairy, fruits, and vegetables—changes that didn’t sit well with all clients. However, our commitment to gathering input from clients through menu brainstorming sessions at each group home, administering an annual client menu survey, and offering taste testing opportunities has helped clients choose healthful foods that they enjoy. At many group homes, anyone who is working during meal time is responsible for menu and meal preparation, and homes will often have multiple “chefs,” none of whom has cooking or menu planning as part of their job description. To ensure compliance with our wellness guidelines, we identified a single cook at each residence and created a more accurate job description for the position. Cooks use our preplanned menus, which ensure nutritional meals and allow bulk food purchasing. We created a central foodservice managementposition to help promote consistent foodservice standards and provide skilled supervision for the cooks. Creating a support system and sense of camaraderie among our cooks was essential if they were to become advocates for healthful eating. Staff members working as cooks and/or with foodservices took part in our wellness course and were specially trained to ensure that food safety and handling was in compliance with state regulations. The Home’s wellness initiative is a work in progress. Moving forward, we plan to begin more formal physical activity offerings, expand our wellness support to our community-based programs, and perhaps develop a vocational culinary course within our educational services. As social workers, we all have the tools and, indeed, the mandate to influence physical well-being among our clients. In doing so, we should be mindful that physical wellness is a multifaceted issue and one that requires a holistic, structured, and thoughtful approach. — Peter Evers, LICSW, is vice president of program operations at The Home for Little Wanderers in Boston. — Mary Barber is wellness project manager at The Home for Little Wanderers.